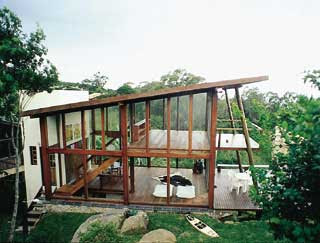 Hunting for a Brazilian cantilevered house that I remembered after yesterday's post (which I couldn't find), I came across this little Brazilian bach. Another little summer retreat, it's full glass and opens right up so that you can eat in relative cool, then has a great solid stone clad basement for sleeping comfortably below. Using the slope of the land, each room has an exit to the beach, and the mezzanine has a lifeguards view of the incoming waves. 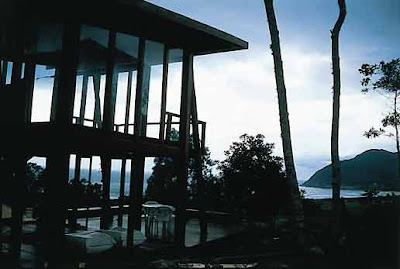 Simple timber and glass construction allow, the upper two storeys (the only ones visible from the beach) to blend in with the surroundings and let in all the sights and sounds of the beach. There's a minimal solid structure at the rear, supporting everything and housing the majority of the plumbing and water tank no doubt. This beach is fairly far down the coast in Brazil, so I am picking this has just the right amount of overhang to block out the midday sun, yet let in all the light in winter. With a permanent population around 12 thousand inhabitants, Garopaba, a city on the Catarinense coast, is situated little more than 80 km from Florianópolis. The diversified relief and the beautiful local nature are some of the elements found around Silveira beach, where Helena Karpouzas projected this pretty summer house. 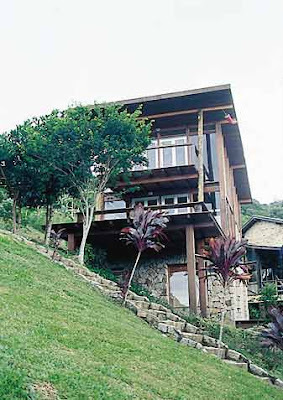 The construction of this residence, built on Silveira beach, in Garopaba, Santa Catarina, Brazil, begins with a stone built basement, anchoring the delicate open spaces of the floors above. Helena adopted as conceptual base of complete interaction of the residence with the surrounding nature, as much in it's relation with the ground (steep slope) as with the surrounding landscape, whilst incorporating a decent sea view. "The geometry of the construction is basic, there's no complexity to it and the floor plan is as simple as possible. ", argues the architect. The intention of the design was to catch all the available light of the natural elements (Sun, Moon, stars), as well as all the wind and all the sounds, justifies Helena. 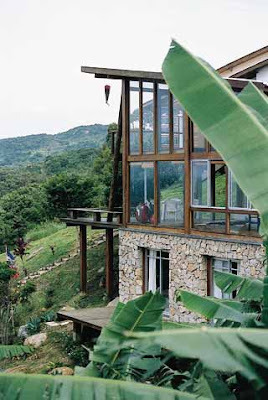 "I wanted to establish a conscious inseparability of the house and it's surroundings, in all directions". The basement adopts a simple plan, constructed in stone, "a technique inherited from the Portuguese by the natives of the beach", says the architect. On this floor, drawn out of the ground, the bedrooms and bathrooms are located. On the first floor, of similar dimensions, sit the kitchen, dining and living areas. 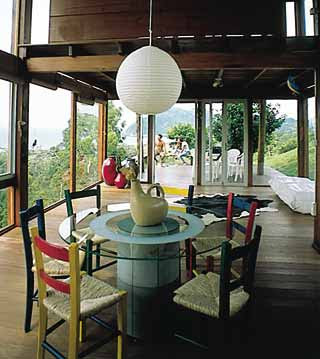 The large wood framed glass windows and aluminium structure, make this level seem bigger than they are. 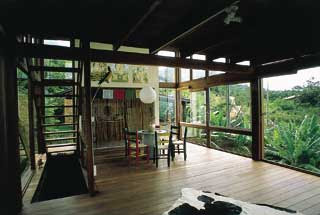 The mezzanine above incorporates the same features (glass and wood). 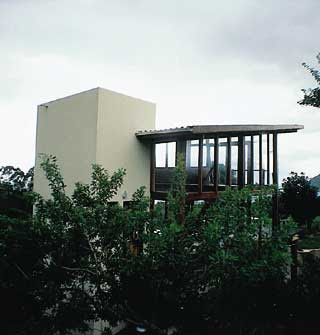 The decks extending on each of the upper levels, beak up the box shaped plan of the house.